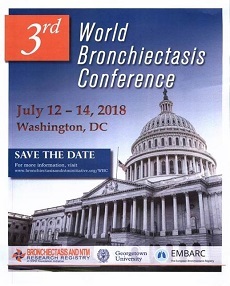 The world‘s leading bronchiectasis researchers and clinicians are supporting EMBARC, PROGNOSIS and BREATH in the endeavor to make this first World Conference on Bronchiectasis a success. The COPD Foundation Bronchiectasis and NTM Research Registry, which was established in 2007 and facilitates clinical research and clinical trials in bronchiectasis and nontuberculosis mycobacteria (NTM), is an important partner who secures the link to the US American stakeholders of this conference. The conference is officially endorsed by the European Respiratory Society (ERS) and the European Lung Foundation (ELF), representing European patients with bronchiectasis.